Winners of the Flower Show put on by Creemore Horticultural Society at Station on the Green on July 7: Outstanding in Cultural Division – Linda Kelly; Outstanding in Decorative Division – Linda Kelly; Horticultural Society Hisey Award – Linda Wright; Youth Award Judge’s Choice – Morgan Timmons for her Paper Bag Lunch entry. The summer show is the only one with a youth division. Darci-que and Emily once again worked with their summer group to produce 22 entries. Three other entries were from the grandchild of a member. We always appreciate this addition to the show. These entries were delightful and beautifully presented. All youth entering received ribbons and all first place winners were provided with a prize. 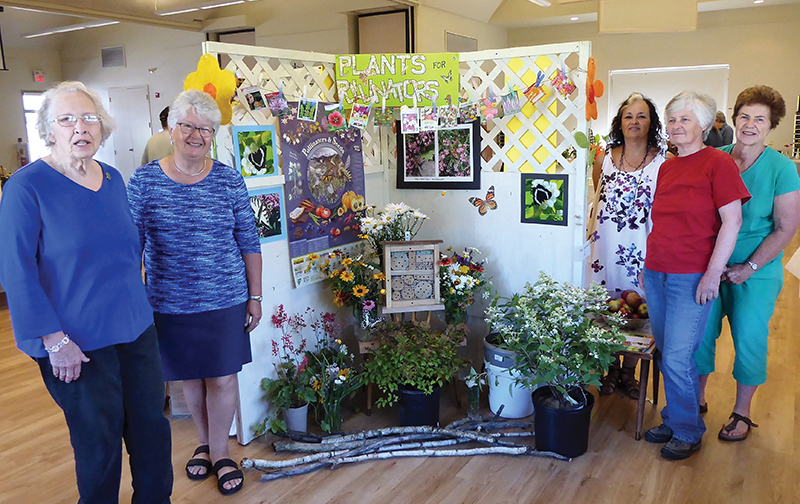 Contributed photo: Members of the Creemore Horticultural Society, Dorothy Shropshire (from left), Kathy Meeser, Linda Kelly, Linda Wright and Liz Smith with their display created for the flower show at Station on the Green July 7.